A simple dinner but delicious dinner. 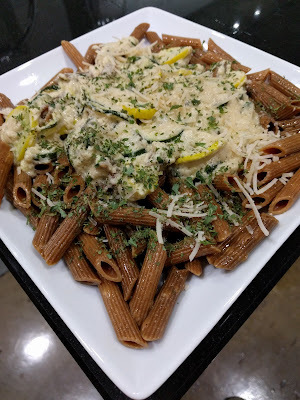 Toasting the penne is not required, but adds so much to the taste, color, and texture. Toast penne, on an oven sheet, in oven for 10 minutes, then stove cook per instructions. Combine tahini & mayonnaise in large bowl. Gently stir until thoroughly mixed. Saute the chopped yellow squash in the skillet over medium heat until tender. Drain Penne, add the tahini/mayonnaise, and mix until penne is well coated. Lastly, add the squash to the pasta mix & well toss. Sprinkle each plate with parsley and parmesan to taste.